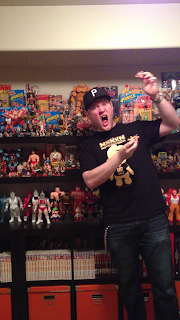 NNWA RECAP and "Nama Niku Talks Shop"
Hello, and welcome to the newest RAMPAGE blog post! 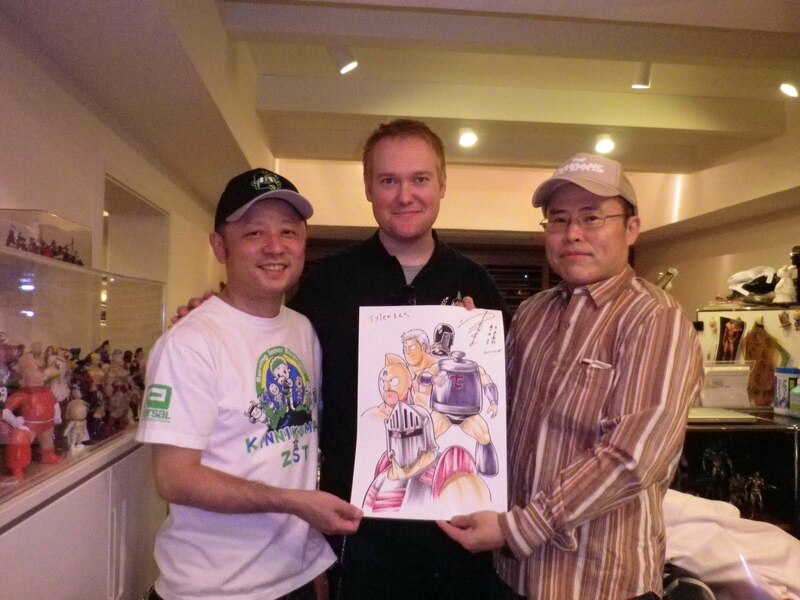 So, the recent Nama Niku Wrestling Alliance event was a SMASH success! A whole bundle of Keshi makers, collectors and otherwise dorks showed up, and there were drinks, toys and important conversation （笑） to be had in abundance! What Makes you Psyched on all this stuff? What is your favorite move in the Chojin Dreamtag Arch? 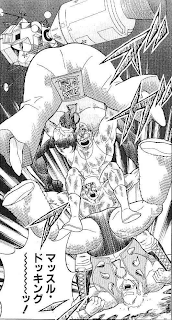 Seriously though, what peaked your interest in Kinnikuman to begin with? OK. The hard facts. 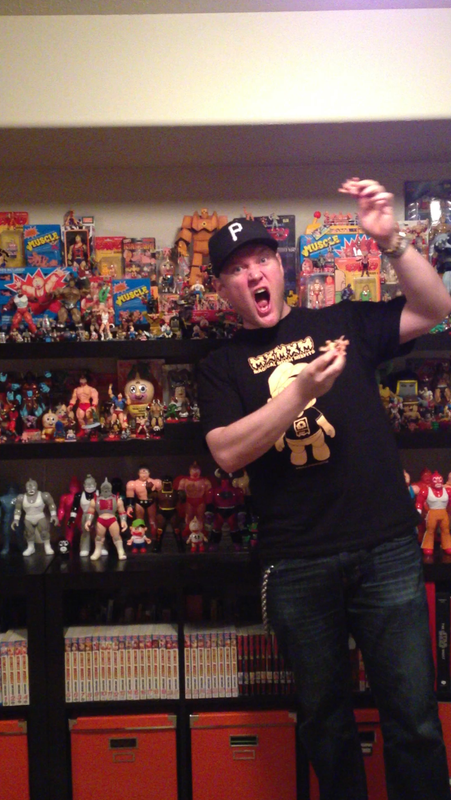 How many figures do you own? 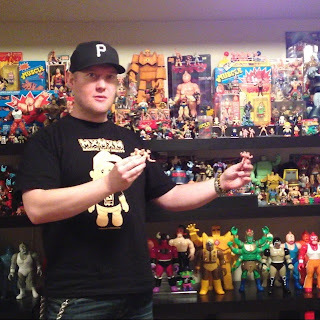 Anything in particular that you have in your collection and really treasures? Tyler with his heros at Studio Egg! Moving on. What is Nama Niku all about? What are you trying to accomplish with the blog and your figures? Some of Nama Niku's "Whisky Sasquatch" figures that recently sold through the Mandarake twitter feed! Tyler and the Nakano Broadway Microkan headmaster, Miyakoshi-san. True Yudeki! True Yujo Power! That’s Neat. So, what’s next on the agenda? 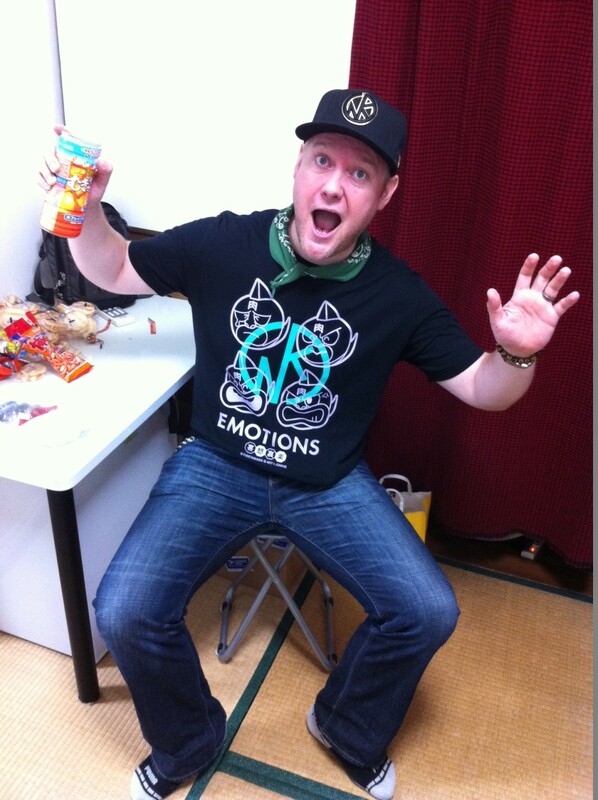 NAMA NIKU (Tyler) rocking the new Art Junkie "Kinnikuman Emotions" Tshirt - released at the event, and available NOW in the RAMPAGE SHOP! 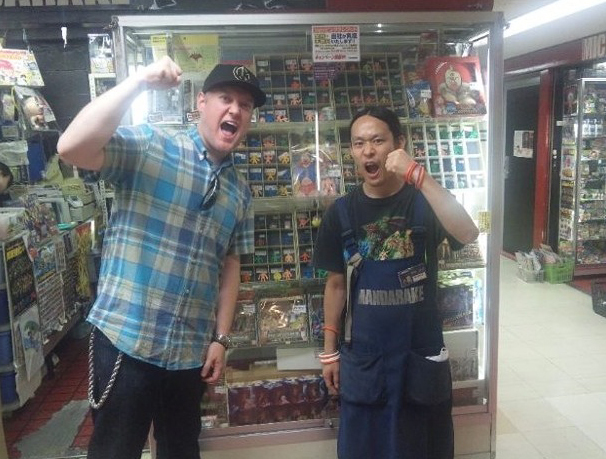 Big thanks from both Tyler and myself to all who came out for the event, to all who grabbed some of the awesome keshi released at the show and to all the folks who have grabbed some cool toys from the shop since the show has ended. Good Times! So... Toy Art Gallery (TAG) recently had this little shindig at their LA shop. Loads of folks (a wide range of customizers and figure makers and such) did customs on Paul Kaiju's biggest figure (for chris'sake - don'call it a 'platform'!) - the Pollen Kaiser. I was glad to be invited to take part - very fun figure to paint. However - I've been so busy swimming and playing with keshi that I barely took the time to really share any information about this thing! HAH! So - here it is (alas...phone pics only). GID vinyl base and Sofvi and FOK FTW! Thanks to PK for making a cool figure and to TAG for sending one over to paint! Having the GID base to work with was a super bonus - but It was hard to get started on as I REALLY wanted a new night light! No word on if this guy sold yet, but I'll update ASAP if I know it's still hanging out at TAG. 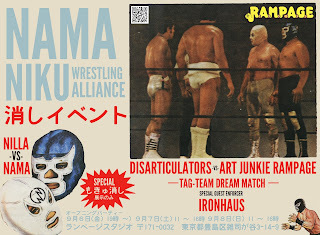 Another post will be up ASAP - featuring a review of the recent NNWA event here at RAMPAGE STUDIOS - AND and interview with NAMA NIKU that will blow the minds of all you keshi fans and yudeki! Thanks for having a peek at the Blog! After an amazing summer, filled with all manner of watersports and tomfoolery, it's time to get serious again. 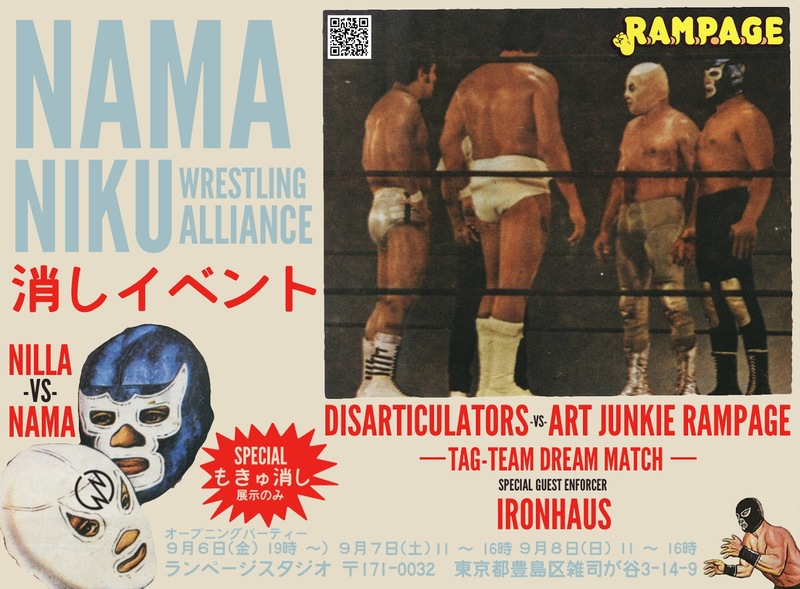 This Friday sees the opening of the highly anticipated Nama Niku Wrestling Association (NNWA) Event! This one will be a doozy - featuring exclusive handmade keshi from a bunch of the best guys out there, including: Nama Niku, Trutek, Eric Nilla and Mokyukeshi. Many of the figures in the show feature the sculpting talent of Ironhaus and the Might Zectron - truly talented dudes! 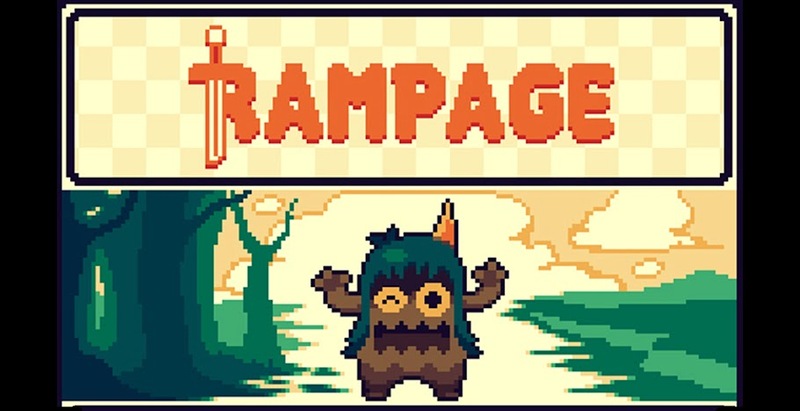 The show will take place at RAMPAGE STUDIOS (address in the right hand nav bar, over yonder -->), with the opening Party happening this Friday (9/6/2013), starting at 7PM (and on into the night I imagine) and open times on Saturday and Sunday from 11AM to 4PM. Sales start on opening night, with any remaining stuffs hitting the online shop afterwards. Here's a look at some of the goodies that have been showing up. It's like CHRISTMAS opening the boxes when the express delivery man shows up! The new DEATHMATCH figure from Nama Niku. New Ironhaus x Trutek HORDE - wave 2! Thanks to Trutek and Nama Niku for the pics! Thanks to all who pre-ordered Black vinyl Unicorns, Micro and Dinos over the past week! The order has been placed at the factory and I expect to be able to ship prior to the end of October.